The Texas Directory of Community Development is the only comprehensive source of information on non-profit organizations, for-profit enterprises, and governmental entities working in the field of Community Development. The Directory is the place to look for practitioners and partners, whether in the field of affordable housing, finance, small business development, tax credits, bonds, commercial revitalization, consumer education, foreclosure prevention, or any related Community Development activity. 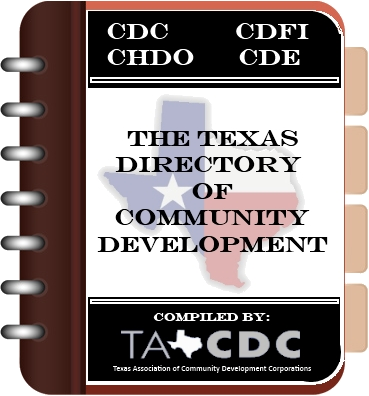 The Directory is a service of the Texas Association of Community Development Corporations and its members. This interactive Directory allows listed entities to be sorted by name, location, activity, or a number of other ways, making it quick and easy to find the group, business, or specialization you’re looking for. The Directory contains a basic listing for every business or entity that has been identified as engaging in Community Development activities. If your organization is not found in the basic listing, please click the "Get Listed" button above to have your basic information listed (name and location). 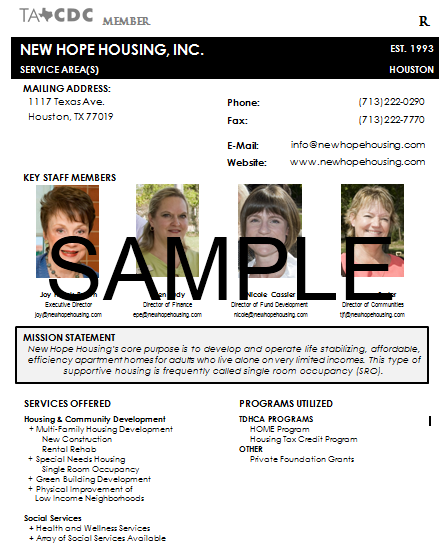 If you desire an enhanced listing (free to TACDC members) you will receive a comprehensive listing with the names, photos and contact information of your key staff, a full description of the mission/activities of your entity, your service area, and any other information you wish to be a part of the directory, such as planned projects and partnership opportunities. TACDC non-members can receive an enhanced listing for only a $50 annual fee. TACDC Members receive a FREE listing as a benefit of being apart of TACDC. Non-TACDC Members can get listed for $50.00 or by joining TACDC.